WORMWOOD FILES: The Giant Spider Invasion! In my scientific career, I’ve spent a good deal of time working with spiders. Usually I’m trying to get our eight legged friends to grow to outlandish sizes. Never understood why that would bother so many folks, but humans to me are a bigger mystery than arachnids. 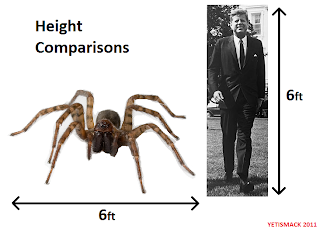 I must confess, my experiments have not yielded much success so far (although that tarantula got away from me after the lab caught fire), but I have learned that maybe nature has managed to produce spiders of truly prodigious size anyway. How big are talking about here? Bigger than a hand? For sure! Bigger than Kitty? Yes indeed! Bigger than Fido? Hmmm, depends on what kind of pooch you’re talking about. Bigger than a Volkswagen? No, not that big! But big enough to cause the average humanoid (particularly of the female variety) to run shrieking in horror! That’s the spider we’ll be talking about in this edition of the Wormwood Files. It lurks in the deepest forests of what is now known as the Democratic Republic of the Congo and the natives call it the j’ba fofi! The year was 1938 Two Rhodesian travelers, George and Marguerite Lloyd, were trekking through a very rugged and remote part of the jungle in what was then called the Belgian Congo. As they were trundling over the barely passable road, something large and dark crawled across their path, from one side of the road to the other. At first they thought it could have been a monkey or perhaps one of the small antelopes known as duiker, but with mind-numbing horror, they realized this creature had eight spindly legs. The conclusion was unthinkable: a spider with a leg span of between four and five feet had almost collided with their vehicle. Mrs. Lloyd was almost in hysterics and demanded they leave the jungle and return home at once. The Lloyds were familiar with native wildlife and were considered people of good character. Mrs. Lloyd was so shaken by what she had seen that nobody doubted she had encountered something grotesque. But few could believe in a spider of such tremendous size. 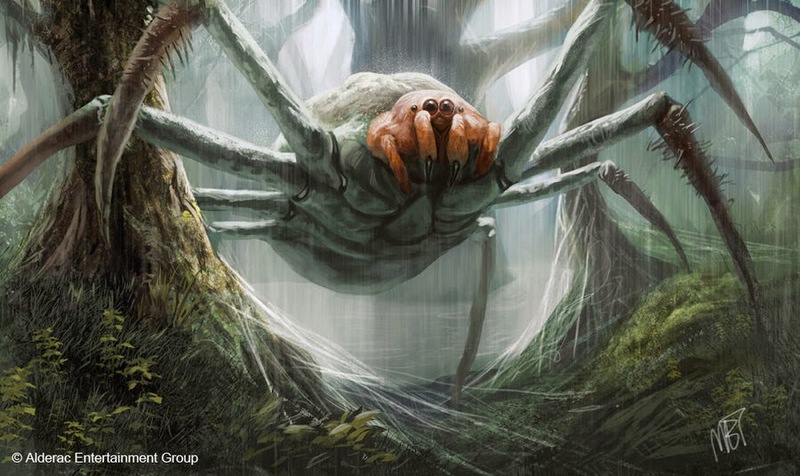 If they had bothered to consult the area natives such as the Baka tribe they would have learned that the giant spiders…the j’ba fofi…were considered long-time dangerous inhabitants of the deep forest. Native descriptions of the j’ba fofi were detailed and precise. The monster spiders were a dark brownish color when mature and reached a maximum size of five feet across, although usually smaller. When they were immature, they were bright yellow with a purple-tinged underbelly. Eggs were white or yellow and resembled peanuts in size. They were laid in clusters that were covered by webbing. The nests of the j’ba fofi were made of leaves and debris glued together by webbing. The monsters were said to be devilishly clever in capturing their prey; they would string low strands of webbing across jungle clearings and then wait nearby in depressions covered with leaves. When something stumbled into the webs, the spiders would leap out of hiding and attack. As might be imagined, their sting was fatal. What makes native reports of the creatures convincing is that the spiders are described matter-of-factly and not given any supernatural attributes. Many cryptids are thought to be magical or spiritual creatures by indigenous tribes, which often confused the issue of whether they were real animals or not. But the Baka and the pygmies of the Congo talk about the spiders in much the same way they would discuss lions or large snakes…as natural dangers to be avoided. It is also worth noting that these same natives agree that the j’ba fofi are much less numerous than they once were and are now seldom encountered. The Lloyd’s sighting of the monsters was the most well-documented sighting by Europeans but by no means the only one. A British missionary named Arthur Simes had a terrifying experience with the j’ba fofi while exploring the wild area around Lake Nyasa in Uganda, which borders the Congo. While traversing a particularly difficult stretch of underbrush, several native porters accompanying Simes became entangled in thick white webbing. Simes was horrified to see several large spiders with a leg span of over four feet come out of hiding to attack and bite the unfortunate men. Simes and other expedition members used their pistols to chase off the creatures, but it was too late for their victims, who became hideously swollen and delirious before dying in agony. Simes’ story has the flavor of a good old English “ripping yarn” of wild adventure in far off places. These were tall tales sometime passed off as truth, making for exciting reading for England’s “armchair adventurers”. Yet the story does fit with what we know of the j’ba fofi…the area is one they were said to frequent, their method of attack matches native reports and the description of the creatures themselves fits as well. The j’ba fofi is by far the most well-known giant spider but it’s worth noting that it is by no means the only one. There have been scattered reports of monster spiders from Papua New Guinea. That country is actually a logical place for large unknown animals to hide, as it remains one of the least explored areas on Earth. World War II soldiers from several nations reported hearing of the New Guinea giants during action there. The dense jungles of Venezuela in South America have also been said to harbor spiders of tremendous size. Villagers in remote areas have reported that chickens, dogs and even human infants had been carried off by titanic arachnids. But no expedition has ever found evidence of such a huge creature. Do these fearsome animals really exist? There is actually a very sound scientific reason why monster spiders are an impossibility. Spiders, like other insects, do not have lungs like mammals or reptiles do. Instead, they rely on thousands of tiny tubes throughout the body that carry oxygen. These small tubes are simply incapable of carrying oxygen to large organisms. The biggest known spider is the goliath bird-eating tarantula, which can grow to be a foot across and weigh 2 pounds. The j’ba fofi is a much bigger and heavier spider…one whose existence is impossible by all known biological laws. However, the same can be said about the common bumblebee. According to known laws of aerodynamics, a bumblebee should not be able to fly. But obviously they do and no scientist would dispute it. Hundreds of millions of years ago, before even the age of the dinosaurs, the oxygen content of Earth’s atmosphere was much higher than it is now. That allowed huge insects to exist. The fossil record shows that there was once a mega-spider called Megarachne servinvei that had a leg span of over 20 inches. Even so, that is still well off the size of the j’ba fofi. And it was 300 million years ago. But 300 million years is an awful long time ago. Could it have been possible for an organism to evolve during that time…for a spider to develop some alternate way of breathing that would allow it to bypass the size restrictions of nature? If that was a common thing, then human beings would probably not exist and the world would be dominated by monster insects. The swampy interior of the Congo is described as being “prehistoric” and virtually unchanged for millions of years. Other supposed “exiles” from time like the dinosaurian mokele m’bembe are said to live there. If any place in the world can be said to be a “lost world”, the desolate areas of the Congo would be. There is some speculation that the j’ba fofi might be a kind of giant land-going crab instead of a true spider. It is true that there are some monstrously huge crabs…the cocanut crabs of the South Sea islands are enormous and hideous looking things. But they are also harmless herbivores and they crawl so slowly that any animal faster than a crippled tortoise can outrun. They certainly do not resemble the quick hunters that the j’ba fofi are said to be.